Surprisingly, it's a little difficult to find a Dream 18 worthy opener. A lot of courses have relatively benign starting holes. The 1st at Bandon Trails can be difficult if it's into the wind, but generally it's not an overly demanding start to the round. I love the 1st at Trails because as you walk up to the first tee, you feel like you've been transported to another planet. It looks like you're playing golf on the moon. Dunes and deep bunkers everywhere make the first tee shot a lot more intimidating than it really is, there's actually a lot of room to hit the ball. Find the fairway and you'll probably only have wedge or less into the green. As we say, 'Hit Until You're Happy' on the first tee because you'll definitely want to start with par or better on this course. From otherworldly and rolling to straightforward and flat. Pinehurst is an amazing place. You probably know that Pinehurst is right there in front of you off the tee, but the challenge is the greens. Even with a good drive, you're probably hitting mid- to long-iron into this green. The 2nd hole was my first experience trying to chip into those reverse punchbowls, and my chip made it half way to the hole and rolled back down off the green. My advice to you: use your putter and say a prayer. Here's your chance to really bomb one, as it will likely play downwind (at least in the summer). Obviously, you want to stay down the left side. The approach shots is probably one of the most fun golf shots you'll ever hit in your life. Aim left and shots will feed to the right towards the green. You probably can club down 2-3 clubs and try to run one in there. However, deep bunkers short and left on the green need to be negotiated, otherwise a big number is a real possibility. 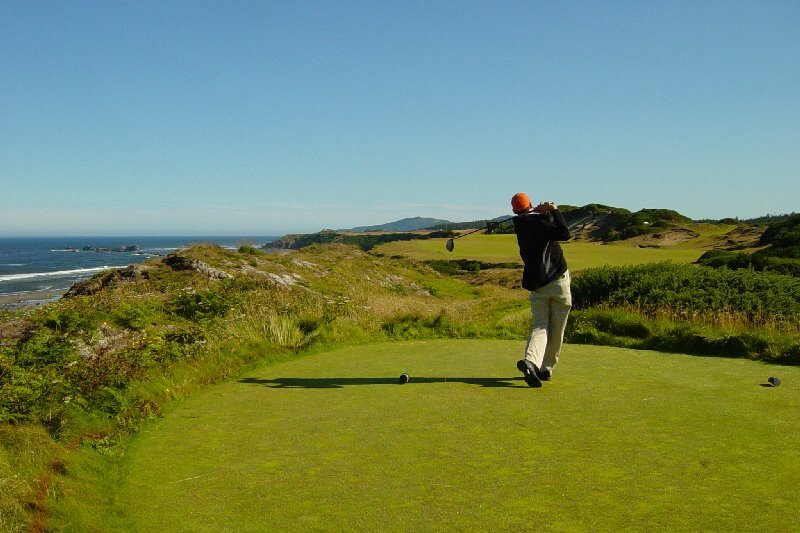 I believe Tom Doak originally wanted the tee box to be below the surface of the fairway, so you'd be hitting off the slope of the cliff up into a blind landing area with nothing in front of you except a giant cliff, gorse and ocean. That would be unique, but why tinker with what is already one of the great golf holes in the world. When I first started this project, there were 4-5 no brainers that were cemented into the list. The rest of the holes of my Dream 18 would have to work around these all-time favorites. #4 was one of them, so is #5. Made in Heaven. I fell in love with this hole the first time I stepped up to the tee box in 1996, and it hasn't failed to deliver in the 7-8 times I've played the course since then. You make the long trek from the 4th green (part of the original Blackwolf Run when they had only 18 holes) to the 5th green (the first hole in the new 18 that was later split amongst River and Meadow Valleys) knowing just how good this hole is, still it never gets old. You tee off from high above the fairway, into the river valley below. The river frames the hole on the right. There's lots of room off the tee, with the elevation change you can really bomb it. Be mindful of the wind as you may not feel much in the chute that you're hitting out of. The tee shot is only half the battle. The green sits high above the fairway on an angled plateau. Miss the green right and you're dead -- you'll be trying to get up and down from 30 feet below the green (good luck!). At the very front corner of the green is the smallest, nastiest little pot bunker you've ever seen. A small piece of Hell in this otherwise divine golf hole. One of the most famous par 5's in the world needs no introduction. Hogan's Alley. Car-nasty is the toughest course I've ever played. Break 90 and you'll feel like you've accomplished something. The 6th is no exception with out of bounds bordering the left side of the hole. I love the center bunkers in how they make you think off the tee. Flirt with the out of bounds left and you have the best angle into the green. Bail out right and you're dealing with the bunkers and have a tougher second shot if you do find the fairway. I wonder how many balls they find in that farm that borders this hole. One of my golf balls is over there. You'll have new found respect for Ben Hogan after playing this hole. I told you the par 3's at Straits were good. It's hard to pick between the 3rd and 7th (some people prefer 12 or 17), so why not include both of them in front nine (at least until I get the chance to play Pebble Beach)? Shipwreck is almost a reverse mirror image of the 3rd, but it's longer and the water and shoreline come into play even more. Good luck making par if you miss the green right, although I've seen it done (my father-in-law hit onto the rocks down by the water, chipped it over the green then chipped it in for a routine 3). I've yet to play this hole without breaking out the ol' pirate voice: 'Arrgh! Hell's gate' Never fails to not get a laugh from my playing partners. I can't help myself. You're hitting downhill through a chute and over a ravine. You can only see part of the fairway below, but you want to be aggressive and aim as far right as possible. If you clear the trees, there's a nice slope short of the fairway that should kick the ball down into the short stuff. Decision time with the 2nd shot. The fairway splits in half. The upper fairway has the direct path to the green, but the hole is banked up against the river -- there's a little bit of room right, but it's nasty, nasty stuff. Play it safe to the left and you're left with a tricky half-wedge shot where you can't see the putting surface. Good luck, matey. The 9th was one of the toughest holes for me to choose. It boiled down to Pacific Dunes or another hole at the River Course at Blackwolf Run, Cathedral Spires. In the overall routing plan, Cathedral Spires might be a better fit given I currently don't have any other short par 4's. The Spires gives you three distinct lines off the tee, a) aim way left of the large trees directly in the middle of the hole, leaving an open angle to the green; b) fly over or through the trees, leaving nothing more than a chip and putt for birdie, or c) flirt with the river on the right and try to drive the green, given you a chance at eagle or double bogey. I love the 9th at River, however the trees have grown in to the point where options 2 & 3 are extremely difficult and barely options at all. I think if they were trimmed back, it would make for a better golf hole. 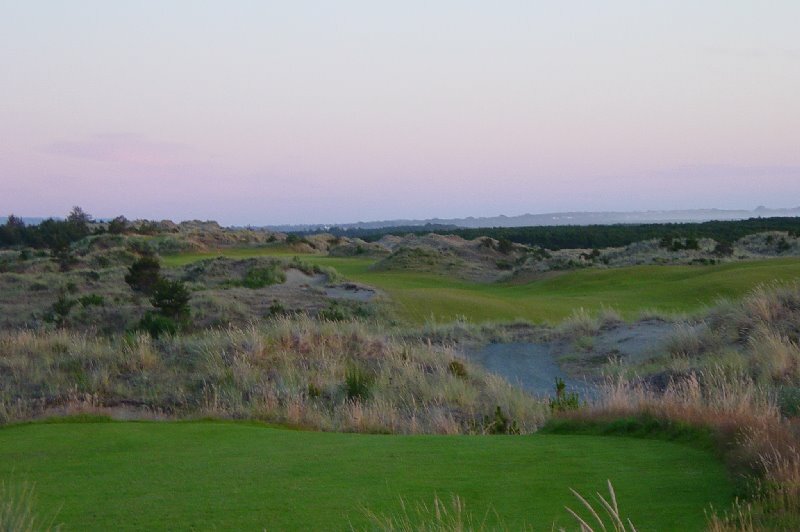 I must like options, because the 9th at Pacific Dunes has two distinct greens. Your drive is over a steep slope with bunkers to a blind fairway. The green on the right is uphill and to the right. The green on the left is downhill and to the left. They switch the hole locations daily, but I've only played to the left green in three rounds there. As with most greens at Pac Dunes, you'll have some fun with your approach shots as you can use the slopes to feed the ball to the hole. This is really a toss-up for me. Maybe my dream 18 can have two 9th holes with three greens. Hey, it's my dream, isn't it? I gotta give some love to UniRidge, the lowest-ranked course (#23 in my rankings) with a hole in my dream 18, but a course that I've been playing at least once a year for the last 10 years. The 10th is a stern long par 4 framed by trees on both sides of the hole. There used to be a lone tree on the right side of the hole about 250 yards out that really would get in your head. They've cut it down, but it hasn't done anything to diminish the hole. You'll likely be hitting a mid- to long-iron into a slick, left-to-right sloped green. They used to always start on both nines at UniRidge, and I've started on the back nine enough times where this hole could probably qualify for my opener. 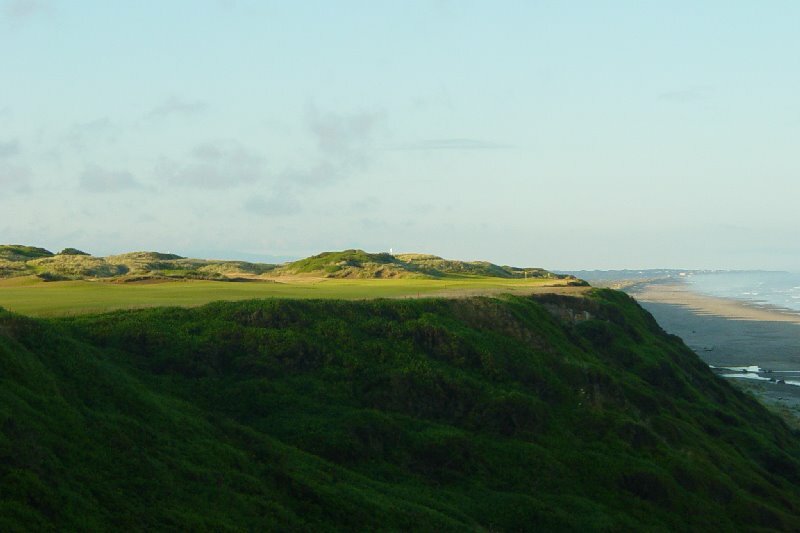 You can flip a coin between this hole and the par 3 11th at Pacific Dunes, a nice short par 3 right on the ocean (check the video below of me trying to hit this green in a four-club wind). Either one would work well on my Dream 18, but I give the slight edge to the Old Course. One of only 2 one-shotters on the course, yet still one of the best par 3's in the world. You've got three nasty, nasty bunkers (Strath, Hill and Shell) to look out for (when bunkers have names, you know there not there just for show). The hardest part of this hole is finding and then putting this green. A huge slope back-to-front can wreak havoc on your scorecard. Other than the 18th with the Swilken Bridge, the town of St. Andrews and the R&A serving as the backdrop, the 11th may be the most visually appealing hole on the Old Course. The 12th at Arcadia has Lake Michigan bordering the entire left side of the hole, about 100 below the tee box. Take part in a ceremonial drive into the Lake as you wait for the fairway to clear. This is just a mean, tough golf hole. If the pin is on the left side of the green, good luck. A deep bunker guards the entire left half of the green. Try running it in from the right side. The 12th at Arcadia used to be the 16th in the original routing of the course. It would've faced some stiff competition at 16, but it's a natural fit here. The 13th at Pac Dunes is another lock for the Dream 18, and the 3rd hole from Tom Doak's masterpiece on the list. I've played this course three times, and I've yet to do any better than double bogey. There's just so much trouble here. In the summer, it's likely to play into a stiff wind. Again, you're faced with the proposition of starting your shot over the ocean and praying you judged it right. As I found out the hard way, the bunker well short and right of the green will swallow up a lot of weak approach shots. And good luck if you find the dunes on the far right. A beautiful but deadly golf hole. You simply can't ignore the Old Course. It's amazing how the original golf course can have so much strategy and have so many great holes that have withstood the test of time. 'Long' isn't even that long by today's standards, but it's still one of the great par 5's in the world. If you can keep your drive in play, you'll still need to make sure you avoid the Hell Bunker on your 2nd shot (and by the way, you won't be able to see it). The double wide green slopes from front to back. Mercy! This is one tough hole from the tips, especially if it's into the wind. Get out your 3-wood. All you have to do is carry it about 210 yards over a giant chasm. You'll likely bail out right, but getting up and down is no bargain either as the green is severely sloped with a big dip in the middle third of the green. I don't know if I've ever parred this hole. Another stone cold lock as this could be my favorite golf hole of all time. Shieza! It's Unter Der Linden. Blast away as you'll need a good drive. Deep cavernous bunker on the left, trees and mounds on the right. The fairway narrows at about 300 yards out, if you get it through the chute, you'll get some additional roll off a downhill slope. This will set up an opportunity to try to go for it in two with one of the most heroic shots in golf to one of the coolest settings for a green complex you'll ever see. The green is set at a right-to-love angle perched about 20 feet above the winding Sheboygan River. Right at the corner is a giant Linden tree for which the hole gets it name. Go for it an two and you have to carry it all the way, likely off of a downhill lie. With the tree there, there's really no angle to run it up. If you decide to lay-up, you have to go far right and beyond the tree to have a good angle for your third shot. You'll likely hit it farther right than you need to, perhaps in the rough making your third that much more difficult. Or you can do what I did last time I played this hole, try to lay up, but hit it to the edge of the water, try to hack it out but hit into the Sheboygan, make double and spoil an otherwise good round. One more tip: watch out for the ledge when reading your putt. There's a lot of strong competition for the 17th hole. It basically boils down to the Road Hole versus the famous island green at TPC at Sawgrass. You can't really go wrong with either one. Both require a unique tee shot -- the blueprint for Sawgrass has been replicated many times, but you don't see a lot of new par 4's being built where you have to hit over a giant shed. But that's part of the charm of the Old Course. Double greens, double fairways, shots over buildings, no real sense of where you're 'supposed' to hit, a road and wall that is in play if you're just off the green? Imagine if these features were on a new course built in the U.S. today. It would get lambasted. But it all fits at the Old Course. And the course is still the model for strategic play hundreds of years later. On 17, you're probably wise to take one less club and aim for the front edge of the green or juest short. Under any circumstances, do not mess with the Road Hole bunker. Unless you're looking for a story to tell your buddies back home. Perhaps a consolation prize for not including the Island hole. You need a stern par 4 to cap off your Dream 18, right? There are a lot of solid candidates to choose from, but they don't get much tougher than the closing hole at Sawgrass. The water left will test your nerves on both shots. Roll in your putt for double bogey and give a mighty fist pump, a la Tiger, Adam Scott, Davis Love or any of the past Players champions. I'd advise against jumping in the water, a la Jerry Pate, although you may want to feed Pete Dye to the gators when you're done. Just for kicks...here's my scorecard if you take the last time (or only time) I played each of these holes. I'll try to rough out a routing for the combined course. Just thinking about these holes back-to-back on the same course has got me amped up to get back out to the St. Andrews, Kohler and Bandon. Hopefully, I can lower my woeful composite score. I look forward to seeing your Dream 18 in the comment section. Interesting list. I heard that the greens at Blackwolf are all dead. Did you hear this and if so, what happened?